Gratitude: A Key to Happiness shares profound wisdom and practical suggestions on how to have gratitude as your natural response to life and how that response can change every aspect of your life. 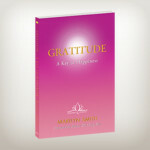 Doing the practices in this book can make your life a continual experience of gratitude and happiness. Countless people worldwide want to experience both happiness and countless people worldwide want to experience both happiness and health. It is possible to have both of these qualities as a very real part of your life. This book will give you a key to do just that. Gratitude: A Key to Happiness shares profound wisdom and practical suggestions on how to have gratitude as your natural response to life and how that response can change every aspect of your life. Doing the practices in this book can make your life a continual experience of gratitude and happiness. Gratitude, happiness, and health are such treasures. This book will give you a key to unlock these treasures.